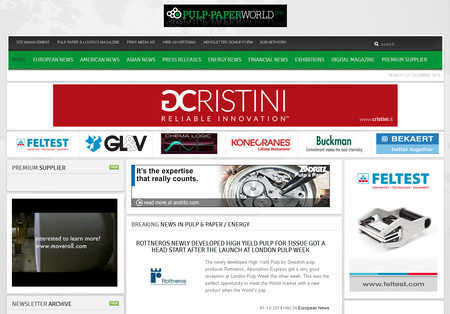 Pulp-paperworld.com is a premier site for the pulp & paper makers and supporting industries, averaging more than 5,000 visitors per month and more than 75,000 page impressions. The extensive and high-quality article content from around the globe attracts industry professionals worldwide. Banner and button advertising give you the opportunity to capitalise on that traffic and increase the frequency of visits to your own homepage or products. By integrating Web advertising into your marketing or lead-generation campaigns, you extend your brand exposure to a highly targeted audience of decision making professionals. Pulp-paperworld.com offers several ad formats and numerous targeted page locations. Right side Bar: Want a large, prominent ad but also want it to appear to 100% of all page visitors? A side box ad is the perfect option. Run-of-Site Button: Reach every visitor to pulp-paperworld.com with our run-of-site top button ad. This ad is located on the top line of the every page of pulp-paperworld.com in order to give you complete site exposure. The ad position is available on a monthly basis. It is especially ideal for events, Webinars and other time-sensitive advertising. Premium Supplier Micro site: The Premium Supplier micro site is a comprehensive business platform for you to get the most out of your company and products, the micro site is a tabulated platform, with a company profile / articles published on pulp-paperworld.com and up to 5 other tabs of your own choice for to you extend your brand exposure to a highly targeted audience of decision making professionals. This service can incorporate text / pictures and even video. No other company ads or branding is present in this area. The service is priced yearly. Price per year € 650 this includes a rotating banner on home page linked to your profile.